Founded as a jukebox repair business in 1969, Konami grew up to become a big video game company, first in the arcades and later in home systems, and then a major holding dealing not only with video games, but also things such as health and fitness, sports and pachinko parlours. Today the 4th biggest Japanese video game company, Konami has one of the most varied line-ups of renowned franchises: from the stealth action series Metal Gear, to action-adventure series Castlevania and Ganbare Goemon, to survival horror series Silent Hill, to sports series Pro Evolution Soccer and Live Powerful Pro Baseball, to shoot-em-ups series Gradius and TwinBee, to run’n gun series Contra, to RPG series Suikoden, to rythmn games of the Bemani series, to dating sim series Tokimeki Memorial and Love Plus, to visual novels Snatcher and Policenauts, and many, many others. And as far as figures (the focus of MFC, after all!) go, they also produced the Busou Shinki and Figumate lines. 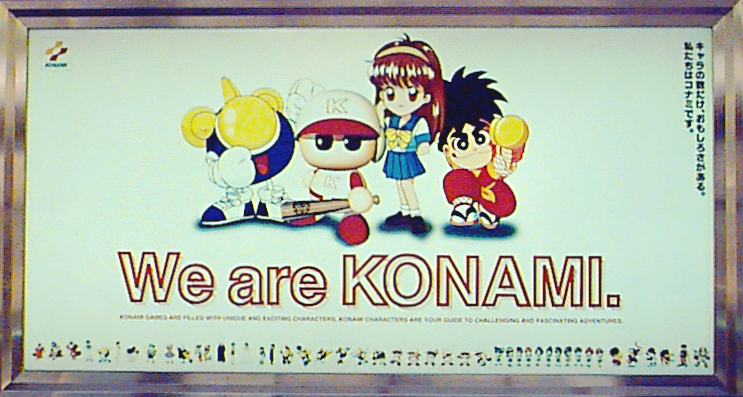 With those franchises’ impact, the memorable Konami Code, and their innovative character merchandising marketing strategy from the mid-90s to mid-2000s via the Konamilook physical stores and Konamistyle webshop, Konami’s influence on Japanese pop culture is undeniable and is felt even nowadays. Konami games are filled with unique and exciting characters. Konami characters are your guide to challenging and fascinating adventures. Your favourite Konami franchises and games? So, Wonder Festival 2019 Winter has come, and per usual with the Konami of today, nothing really new under the sun. I was expecting the lack of Konami IP representation, but that doesn't prevent me from being majorly pissed off. Please, no sale ads on the clubs I've founded, this one included. Use your profile's ad section and lists instead if you want to sell your goods. Late news is late, but for those interested and who didn't know, Good Smile Company is re-releasing Nendoroid Solid Snake ITEM #198330 ! Pre-orders are open since June 5th; pre-order deadline at Good Smile Online Shop is on July 5th at 12:00 JST. Still, the only stuff announced so far is a big one, by no less than Alter: ITEM #604625 from one of Konami's most recent arcade games, Otacadoll! Will be curious to see how this one turns out! At frikkin' last, someone is doing justice to Konami's older franchises at WonFes! I'm especially so glad for the TwinBee franchise (one of my favourites ones from Konami BTW), it's been ages since it got some official merch! Now I'm utterly floored. A compiled, digitally remastered (i.e. with background console noise removed) reissuing of Mouryou Senki MADARA 1 and 2's original soundtracks is scheduled to be released on November 13th 2015!! It's been 25 and 22 years respectively since those great Famicom and Super Famicom RPGs' releases! Continuing on their apparent intention of clearing out older items, Konamistyle has created a special backorder item list page: www.konamistyle... There's currently only media stuff, with most of them being CDs with a few DVDs and Blu-Ray mixed in. The campaign lasts until April 19th (and until stocks run out), so if you collect Tokimemo 1 / 2 / 4 / Only Love / Chu! goods, go grab those remaining items while you still can! So, not much under the sun in Wonder Festival 2015 Winter as far as Konami-related stuff go. I'm not surprised, really, given the little non-media merchandise Konami has produced lately. And as far as garage kits go, Silent Hill has been treated with three kits: ITEM #287665, ITEM #287667, ITEM #287668 .